This is all that remains of the Needles radar station. The cruciform shape is typical of the base for an IFF aerial but it is believed that this is where the original metric Type 2 was situated. Established for Joint Services use, The Needles Radar Station first became operational in June 24th. 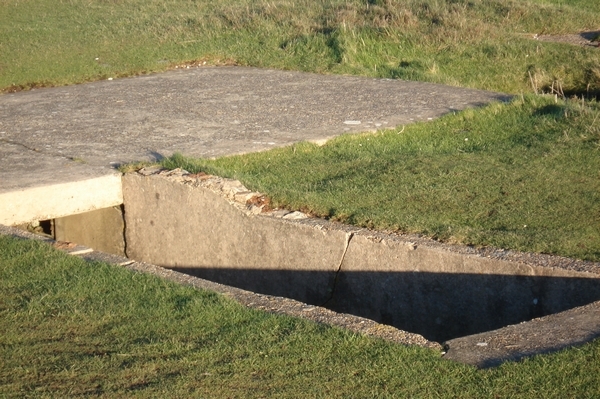 1941 under the aegis of the army to give direction control for the Needles batteries. The RAF took over control at the end of that year to use for Chain Home Low purposes, but it also continued in it's Coastal Defence role. To facilitate this it was equipped with two CRT consoles so that the army/navy could watch for surface traffic and the RAF the lower altitudes, the range for both being limited to about 30 miles. By the end of 1942 the army use ceased, the navy being responsible for the surface watch. The RAF passed on any tracks to RAF Ventnor. Later equipment in use was known as Type 41 by the RAF which was in fact the centimetric navy Type 271 (Mk.5) kit in a fixed cabin with a 10' rotatable parabolic dish which gave a beam width of 3 degrees. The aerial was sited 16 feet above the cliff top which itself was 400 feet above the sea. It is shown here to the right. At some unknown point a second Type 41 radar was installed. In use, although the aerial be rotated in either direction, it was normally set to sweep over a predetermined arc, usually between 120 to 280 degrees i.e. approximately a little wider than between south east and west. The aerial movement could also be stopped and directed at any particular target. A watch was kept over the entire 24 hour period. It is presently believed that a surface operations room also existed and there is uncertainy over where the Type 41 units were situated. In January 1944 the site was regarded as redundant, but continued in limited use, possibly on a care and maintenance footing. The site was finally closed in September 1945 by which time it was the responsibilty of RAF Ventnor. A local Island resident, Elizabeth Hutchings, was a WAAF operator at the Needles and when the site became non operational she continued her service at RAF Ventnor. Elizabeth tells me that the bunker shown was only a room of size approximately 12 ' by 8' allowing only cramped space for the two consoles and a 'place to sleep'. Elizabeth was billeted out in Freshwater. In 1986 Cantwell & Sprack published 'The Solent Papers No.2' and here is an extract. "A major bonus to the defenders, the 530 Coast Regiment, Royal Artillery TA, was the introduction of CD/CHL radar at The Needles in 1941. This could plot ships and low-flying aircraft and was so secret that 700 land mines were laid across the Needles headland and infantry defenders moved in to prevent a German glider borne raid. 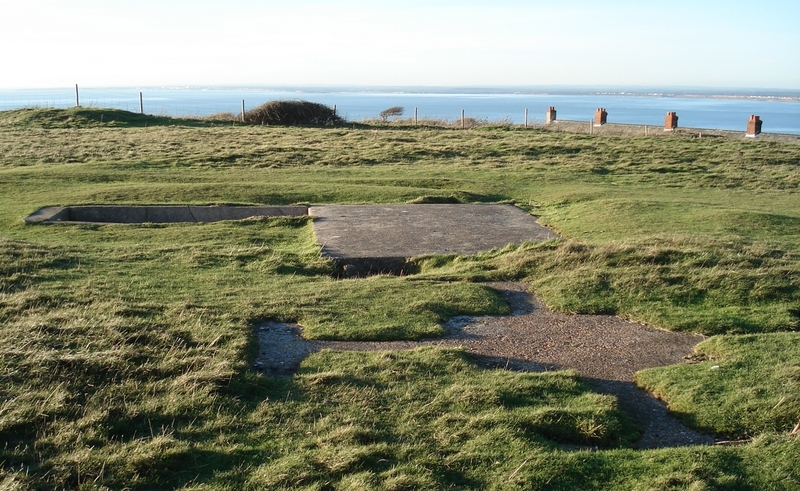 In fact the New Needles battery was the only battery in the area fire command to shoot at known enemy naval targets. On two occasions in 1943 it drove off E boats waiting for British convoys off Bournemouth, but could claim no hits. Vigilance was always maintained as late as June 1944, the Royal Navy expecting desperate German blockship attacks on the exits to the Solent which might seal in the vast invasion fleet gathered there to invade France on D day."